In the booming gourmet cookware industry, the race has been to find the best combination of durable high quality and reasonably low price. 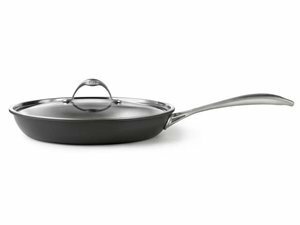 Calphalon has come tantalizingly close with their line of hard-anodized cookware with a strong scratch resistant nonstick coating. Fry pans don't typically come complete with fitted lids. The addition here is a thoughtful touch, as I have plenty of times used whatever lid was handy while cooking in a fry pan. I have had the opportunity to use this cookware extensively and must say I am impressed with the nonstick coating. It is far more durable than others I have experienced. More like part of the metal than an applied finish. I have no concern when using the occasional metal spoon or pair of tongs in this cookware. Although you can cook foods with virtually no oil in a nonstick pan, you really don't want to. Lowfat health benefits aside, a small amount of fat in the pan, be it oil or butter adds considerably to the flavor and texture of fried food. And isn't that what eating is about really? Enjoying the meal. Whatever you do for your health, don't give that up.